PHOEBE Burgess, wife of NRL superstar Sam Burgess, has returned to Instagram three days after her Rabbitohs husband became embroiled in a salacious sexting scandal - and it appears she is sticking him. Ms Burgess, 29, who is heavily pregnant with the couple's second child, shared a photo of her sitting in the sun on a picnic rug beside the pair's 19-month-old daughter, Poppy. The WAG didn't comment on the scandal and Burgess himself isn't in the photo but the caption "Moments in the sun with our babies" and a man's shadow appears that the three were enjoying a family day out and Burgess was capturing the moment. 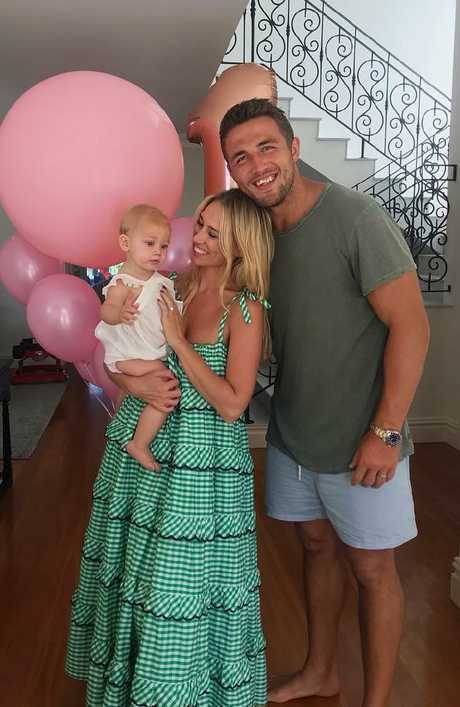 Ms Burgess also tagged the rugby player in the photo, suggesting that the soon-to-be mother-of-two is sticking by her husband despite the bombshell claims he at the centre of a Rabbitohs sexting scandal involving a 23-year-old woman. The club is investigating allegations two players indecently exposed themselves to the young woman without consent via a social media account belonging to Burgess in May. The Daily Telegraph verified that the social media accounts at the centre of the saga belong to the star forward. The club on Friday announced it had set up a five-person panel to look into the incident, including NRL investigator Karyn Murphy, but it is unclear how long the investigation will take. Hours after the news broke, Ms Burgess, a former journalist, was a no-show at Randwick Racecourse, where she was expected to attend the Colgate Optic White Stakes Day in her role as a Colgate ambassador. It is the second time in as many weeks the governing body has been forced to address off-field issues, beginning with Canterbury's Mad Monday antics that resulted in a $250,000 fine.